At least 19 commercial banks should start offloading institutional deposit soon to meet the new regulatory requirement, as the share of their wholesale fund provided by institutional customers exceeds 45 percent of the total deposit. The Nepal Rastra Bank (NRB), the banking sector regulator, has introduced a new provision that makes it mandatory for commercial banks to limit the portion of institutional deposit to 45 percent of the total deposit. The deadline to meet this new requirement is mid-July 2018. The NRB introduced this measure after commercial banks were found extending higher interest rates to institutional depositors, while offering meagre returns to retail depositors. “Privilege accorded to institutional depositors at the expense of retail depositors has hit savings habit of ordinary people. We want this to change,” NRB Spokesperson Narayan Prasad Paudel said. A quick look at returns offered by commercial banks to its customers shows wide disparity. Interest rates on fixed deposit, for instance, ranged between a low of 0.5 percent and a high of 21 percent from January to June, show NRB data. Interest rates on call deposit also ranged from 0.5 percent to 15 percent, while savings deposit rate started at as low as 0.5 percent and shot up to as high as 12 percent. The rates at the low end of the spectrum are generally offered to retail depositors, while higher rates are extended to institutional depositors, according to NRB officials. “This is the reason why banks should not be encouraged to hold a big stock of institutional deposit,” Paudel said. The NRB has defined institutional deposit as money parked at banks by government agencies, state-owned companies, and savings and credit cooperatives. Also, bank deposit of all public limited companies, including banks and financial institutions, is considered as institutional deposit. Some of the biggest institutional depositors in Nepal are state-owned contractual savings organisations like the Employees Provident Fund and the Citizen Investment Trust, state-controlled Nepal Telecom, insurance companies and financial institutions. Gradually, commercial banks that have big exposure to funds of these institutions will have to formulate strategies to meet the new regulatory requirement on institutional deposit. Currently, 19 commercial banks are holding institutional deposit in excess of 45 percent of the total deposit, show data obtained by the Post. All of these 19 banks are privately run. Prime Commercial Bank has the biggest exposure to such funds, with institutional deposit accounting for 69.5 percent of the total deposit. Next in the line is Machhapuchchhre Bank (66.9 percent) followed by Siddhartha Bank (62.1 percent). 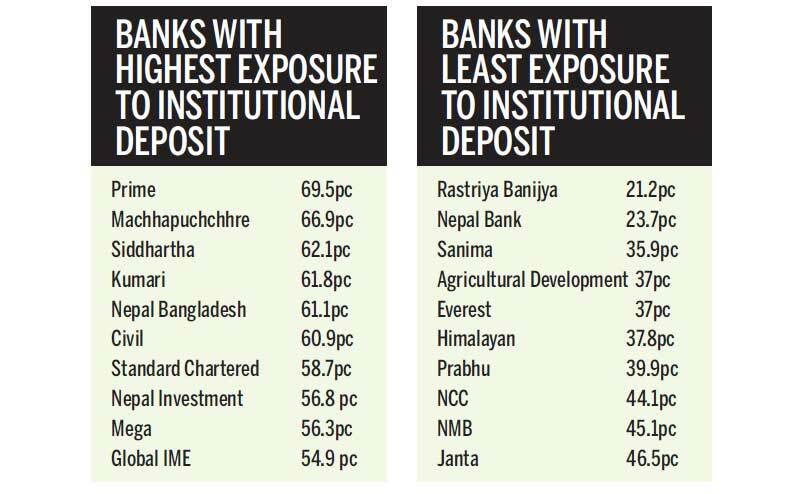 Three banks that have least exposure to institutional deposit, on the other hand, are: Rastriya Banijya (21.2 percent of the total deposit), Nepal Bank (23.7 percent) and Sanima (35.9 percent). Institutional deposits are generally considered as less stable deposits because they are not covered by deposit insurance scheme and are offloaded rapidly in liquidity stress scenario. Also, a big chunk of institutional deposit in many Nepali banks is in the form of call deposit, which can be withdrawn anytime. Because of these reasons, Basel Committee on Banking Supervision has assigned a run-off rate of 100 percent on unsecured wholesale funding provided by institutions like banks, securities firms and insurance companies. This basically means these institutions can fully withdraw their deposits in the case of a crisis. “We are aware of these issues and will soon formulate strategies to reduce the portion of institutional deposit as per the prescription of the NRB,” a senior official of Prime Commercial Bank said on condition of anonymity.